I have long been a fan of Beaujolais--well, Beaujolais of the non-Nouveau variety, at least. I don't have to scramble to explain the Nouveau/non-Nouveau nomenclature so often any more, what with the annual decline in popularity of Nouveau's arrivé-ing, and the coinciding (if not exactly commensurate) rise in popularity of Cru Beaujolais and its cousins, Beaujolais-Villages and good old fashioned Beaujolais. It's a delightful and classy glass of wine for not so much money...in fact, it's qualitatively better than the amount it will set you back, which can't be said for most wines that have widely recognizable (although not so recognizable that they have become commodities) names. I first met Roy Cloud, the man behind importer Vintage '59, ten years ago, and I have seen him occasionally through that time, following (to the degree that it is possible in Ohio) the growth of his portfolio, which has become a treasure-trove of marvelous wines, some of which clearly required some sleuthing to be able to bring to us. 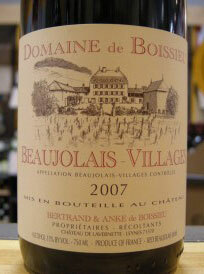 A couple of months ago, I had one such wine, a delicious Beaujolais--Boissieu 2007 Beaujolais-Villages (pictured above). Regrettably, it's not available in Ohio, but I was in Virginia, so there it was that I had the pleasure of drinking this lovely little wine. As I was savoring its blueberry and red currant flavors, I read the back label and discovered two other wines from Boissieu that I really needed to taste. I was quickly able to procure a bottle of Bossieu's 2007 Beaujolais-Leynes. (Leynes is one of 27 communes allowed to attach its name to Beaujolais to act as a distinguishing factor within the Beaujolais-Villages, but in my experience, there is precious little difference cultivated even at the top level between Beaujolais' ten crus, and it's usually even less distinctive between the communes.) Well, I loved the wine, it was a distinctive one (a beautiful bloom of violet candy--an aura that made it hard to quell my desire to sniff it long enough to take a sip--and when I did the crescendo of the whole essence was all I could have wanted. For $21, I thought it was a bargain. With 30 seconds web research, I discovered that it is now sold under a new label--Château de Lavernette...but it is still not available in Ohio. What prompted this post now is that yesterday I did eventually taste the the other wine that intrigued me: the Beaujolais Blanc. It is only a Beaujolais Blanc by a fluke of where the boundary line between Pouilly-Fuissé and Beaujolais is drawn. I have found Beaujolais Blanc to be, as a rule, fairly diaphanous. It's not unpleasant or disappointing, but there is little definition to it, and great Chardonnay should have a real landscape, or at least the hint of one. Well, thanks to the fluke, the Lavernette Beaujolais Blanc is a bargain at around $21, and it's a shining example of what can be: a wine with a lively and robust character and still a suggestion of mystery. Incidentally, Château de Lavernette also makes Pouilly-Fuissé, and I managed to get a bottle of their Maison du Villard, which was another example of continued excellence from this domaine. And there are yet more wines, including a couple more Pouilly-Fuissés and even a Crémant de Bourgogne...where does it end??? Let's hope that at Château de Lavernette, it doesn't.